הפוך עובדים מגלפים את פני ג'פרסון,וושינגטון והמילים "Mount Rushmore South Dakota 2013 E Pluribus Unum"
עובדים מגלפים את פני ג'פרסון,וושינגטון והמילים "Mount Rushmore South Dakota 2013 E Pluribus Unum"
מטבע כסף America the Beautiful | Mount Rushmore National Park שנת 2013 משקל חמישה אונקיות Celebrate a dramatic monument to four of America's greatest presidents while investing your savings in a hard asset. 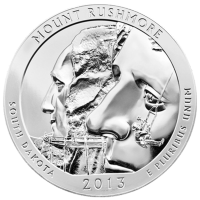 Mount Rushmore was originally conceived of as an attraction to drive tourism to South Dakota. Construction of the 60 foot high carvings took 14 years, and the area is now visited by over 2 million visitors annually. The obverse of the coin features the John Flanagan effigy of George Washington, as it has appeared on US quarters since 1932. The reverse features workers carving the faces of George Washington and Thomas Jefferson. The America the Beautiful series will eventually comprise 56 unique coins by the time the series is complete in 2021. These US Mint coins are a perfect way build your wealth in ounces by investing in a government minted product with a relatively low premium.